In 1946, just prior to the production of Paramount’s mystery-comedy My Favorite Brunette (Elliott Nugent, 1947), Dorothy Lamour, with the full assistance of the studio’s publicity department, staged a memorable stunt. She publicly burned a sarong, the skimpy South Seas garment with which she had been inseparably associated since her first starring role, in Paramount’s 1936 tropical romance The Jungle Princess (Wilhelm Thiele) (Head and Calistro, 67). Between The Jungle Princess and My Favorite Brunette, her busiest period as an actress, Lamour had appeared in 34 feature films, in the process establishing herself as Paramount’s top female box office attraction. Lamour appeared in a sarong in 11 of those films, meaning that fully two-thirds of her roles during that ten-year span did not call for her to wrap herself in any manner of South Seas attire. But there was something indelible about the connection between Lamour and her trademark garment: audiences seemed to remember her not for the variety of roles she played, but for those roles in which she appeared in a revealing sarong. 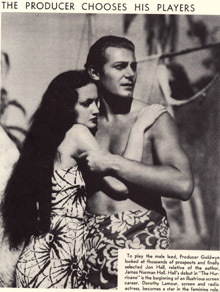 By publicizing the stunt, the studio was offering a non-sarong-clad Lamour to the public, as well as simultaneously reminding them that Dorothy Lamour and the sarong would be forever united. The very act of burning the sarong could only serve as a reminder that Lamour’s sarong pictures were extremely popular. Lamour was always presented in the context of her trademark attire. Despite the stunt, Lamour would don the sarong again at least four more times in her long career. Lamour’s star image was somewhat unusual in that, from her first starring role, the studio found an image that clicked with the public. Her frequent declarations that she was fed up with wearing sarongs indicate that this image clicked all too well. Her track record at the box office showed that the films in which Lamour did not appear in a sarong reaped less money than the ones in which she did. By studying the factors that contributed to Dorothy Lamour’s star image, I hope to make a case for both her uniqueness and her ordinariness. That is, she was special because of the unique persona which was created for her, but she was also just another profit-making device for Paramount. Richard Dyer writes, “Stars embody social types, but star images are always more complex and specific than types. Types are, as it were, the ground on which a particular star’s image is constructed” (Dyer, 1998, 60). Dyer posits that a star image is a complex creation that is comprised of a multiplicity of signs, and argues that it would be incorrect to assume that the texts which contribute to a star image can simply be added together to produce some sort of cumulative “star effect” (Dyer, 1998, 63). In Heavenly Bodies, Dyer writes, “Audiences cannot make media images mean anything they want to, but they can select from the complexity of the image the meanings and feelings, the variations, inflections and contradictions, that work for them” (Dyer, 1996, 5). There is a great deal of signifying information that gets packed into any given star image, and this leads to a complexity from which we can derive a not unlimited number of readings. To get at the essence of Lamour’s star image, it is essential to consider promotion and publicity materials across her career, and to keep in mind the economic conditions that allowed the star system to flourish. To scan every periodical between 1936 and 1987 (the date of Lamour’s last film, Creepshow 2 [Michael Gornick]) would be a monumental task. Nevertheless, for a truly comprehensive study of a star image, such a project is essential. For the scope of this paper, I have turned to the files on Lamour at the Wisconsin Center for Film and Theater Research. The collection runs from about 1936 to 1963, thus offering a good thumbnail sketch of the waxing and waning of her popularity (1). 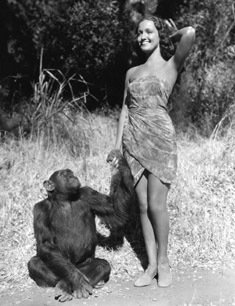 Promotional glossies for The Jungle Princess show Lamour (at all times wrapped in a revealing sarong) in the company of Gogo, or a bare-chested, turban-clad ‘native’ character. One magazine piece circa 1936 shows Lamour posing with a tiger, her legs all but entirely revealed were it not for the the sarong. The text reads, in part, “’The Girl of the Jungle’ [a reference to one of the tentative titles given to Lamour’s breakthrough film] is Dorothy Lamour and many a lad will yearn to protect her in her home in the wilds” (WCFTR clipping file: Lamour). James Robert Parish, in The Paramount Pretties, asserts that a series of successful test screenings of The Jungle Princess were all that the studio needed to fix Lamour’s star image. “Trade screenings and exhibitor reaction”, he notes, provided ample evidence that Lamour was well-cast in the film’s title role (Parish, 335). “In one lucky stab, Dorothy had found a safe niche in filmdom” (Parish, 335) (2). But it was not quite so simple. While Lamour’s South Seas persona may have struck a chord with test audiences, Paramount did not cast her in another sarong picture until late 1937, about a year after The Jungle Princess‘s Christmas Eve, 1936, release date. On the contrary, Paramount cast Lamour in three films of differing genres, then lent her to United Artists for one picture. Paramount then had her appear in cameo roles in two more films, all before suiting her up in a Paramount sarong for the second time. Paramount’s promotional strategy was to place Lamour in its group of promising young actresses, none of whom were yet saddled with identifiable screen personae. I was able to unearth a fascinating studio document which gives some sense of how Lamour was, in effect, lumped together with these other as-yet-undifferentiated starlets. This document is a 1937 exercise manual entitled “The Hollywood Way to a Beautiful Body”, and it features Ida Lupino, one of the same stable of would-be stars, on the cover. The back cover features a list of 16 Paramount actresses along with their measurements. Female readers are encouraged to find the Paramount player whose body types roughly correspond to their own, and to replicate those measurements “by exercising as Paramount players exercise” (The Hollywood Way to a Beautiful Body, back cover). Lamour appears in photographs that instruct readers how to perform a variety of exercises, among them a workout for the arms and hands, and she also demonstrates how to achieve streamlined hips in another photo series. The other starlets who appear in the booklet are shown in nearly identical photo spreads with very similar copy. Aside from an occasional mention of their upcoming films, the emphasis is on the performers’ bodies, grace, and fitness. Lamour receives exactly the same treatment as her Paramount colleagues – they are all promoted as fit and attractive young women, not as star types around whom future films would be built. Though I don’t wish to make too much of this unusual document, I do think it serves as evidence that Lamour’s persona, like those of her Paramount stable-mates, was, at this point in her career, inchoate. Paramount’s first order of business was to promote Lamour as a general commodity; matching her with a screen image was a process that occurred somewhat later. The fact that the fitness manual postdates Lamour’s first film, and that it contains no mention anywhere of sarongs or the South Sea Islands, indicates that contrary to Parish’s assertion, Lamour’s star image did not simply fall neatly into place after a single film. The pace with which Lamour was put to work on new Paramount films shows a studio eager to nail down a bankable image for its new star. The next three pictures Lamour did for Paramount – Swing High, Swing Low (Mitchell Leisen); The Last Train from Madrid (James P. Hogan); and High, Wide and Handsome (Rouben Mamoulian), all 1937 – were made in rapid succession, and were released after the success of The Jungle Princess (Lamour, 61). These three films represent a type of proving ground for the creation of Lamour’s star image. While none of these films is available for viewing, we can get a general understanding of the films’ genres and of Lamour’s roles in them through extant promotional and publicity materials. In Swing High, Swing Low, Lamour, as ‘Anita Alvarez’, was fifth-billed. While studio publicity did not appear to focus on her, her sexuality and shapeliness were highlighted in certain publicity shots. Lamour appears in a sort of sequined bikini that is accented by an enormous polka-dotted bow on her head and a fantastically long polka-dotted chiffon train. Despite the accessories, much of Lamour’s skin is in evidence, and her naturally large lips are heavily lipsticked. Lamour’s role was that of the ‘seductive heavy’, a spirited Latina dancer who attempts to come between the romantic leads (Parish, 336). It is significant that Lamour, at this point in her career, had already been cast as a South Seas Islander and a Latina dancer. Her dark hair and sultry appearance seem to have connoted exoticism, a word which, indeed, is often used in publicity material about her. This trend was to continue in The Last Train from Madrid, in which the top-billed Lamour played the love interest of hero, Gilbert Roland. Publicity material for the film is scarce, but promotional shots play up Lamour’s dark-haired, vaguely ‘Spanish’ appearance. She is clad in black, with heavy lipstick and a black headband (3). With High, Wide and Handsome, Paramount tried yet another tactic. This film had a budget of $1.9 million and was set in the milieu of oil-drilling in 1850s Pennsylvania. The film, unfortunately, is difficult to see (it may not even survive, as far as I know), and I have been unable to locate any publicity materials. 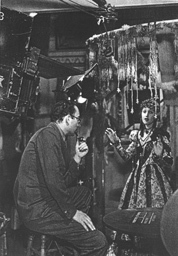 In Lamour’s autobiography, there is a photo of director Rouben Mamoulian directing Lamour on the set of the film. Any ‘ethnic’ qualities she may possess are downplayed. Lamour is presented in full period garb: long-sleeved, patterned dress with a long, bell-shaped skirt. She wears a long beaded necklace, and her hair is curled on top and coiled into ringlets on either side of her face. Most notably, her skin tone is very fair – she appears to be wearing a great deal of powder. The effect is to smooth out and whiten her face, making her appear both younger and paler than she actually is, thus effectively distancing her from an ethnic context. This is in stark contrast to The Jungle Princess, for which she had to cover herself “head to toe with greasepaint body makeup” (which incidentally gave her skin poisoning), in order to darken her skin (Lamour, 90). While it would be foolhardy to make too much out of a single photograph, it at least is evidence of another strategy for promoting Dorothy Lamour. But film appearances and glamour shots do not exhaust the possibilities of image crafting. Lamour’s screen image was one thing, but her ‘personal’ image was another entirely. Of course, both her public and private were created by the studios. An excellent example of the creation of Lamour’s offscreen persona is the caption that accompanies a 1937 photo of Lamour frolicking with a dog on what is ostensibly her own lawn. GLAMOUR GIRL AT HOME – Dorothy Lamour, the glamorous brunette siren who skyrocketed from an unknown to stardom on the silver screen in one year, lives more quietly than any other star in Hollywood. She still lives in the same apartment she rented when she first came to Hollywood but has re-furnished and re-decorated it to suit her own tastes. She occasionally entertains a few close friends at home but explains she is kept so busy that she doesn’t have time to entertain widely. At present, she is busy in ‘The Big Broadcast of 1938’ with W.C. Fields and Martha Raye (WCFTR clipping file: Lamour). The caption highlights her rapid ascent to fame, but counters this with a detailed description of how humble she remains. This ‘regular girl’ image was promoted consistently by various studios throughout Lamour’s career. It was not unusual for a studio to attempt a wide variety of promotional strategies for a relatively new performer. For every photo of Lamour in a sarong, there were countless others of her as a Latina songstress, a humble, down-to-earth young actress, and a doting young mother. It was in Paramount’s interest to bombard the public and the popular press with a multiplicity of images that would suggest a multiplicity of different readings for various audience members. If it turned out that a certain suggested reading was well-received by the public, the studio would be quick to pounce in order to capitalize on what could prove to be a moneymaking promotional concept. Indeed, this is the case with Dorothy Lamour and her trademark sarong. The publicity machine was in full swing, and the studio was hedging its bets. By the end of 1937, Paramount would have a fair sense of which of Lamour’s character types had the greatest resonance with audiences. Ironically, despite all of Paramount’s efforts, it would be a United Artists picture that would cement Lamour’s star image. In 1936, Paramount acquired the services of Joel McCrea for Cecil B. DeMille’s production of Union Pacific, and United Artists received Dorothy Lamour in exchange for the female lead in John Ford’s $2 million South Seas special effects epic, The Hurricane. Though the dramatic demands on her were modest, the studio ballyhoo about Lamour’s performance – and, indeed, every aspect of this large-scale prestige picture – was enormous. The implication here is that Lamour and Hall are just regular people, if a touch more tanned, lovely, and famous. All of these efforts seem to have paid off, not just in terms of The Hurricane‘s box office but in terms of Lamour’s career. 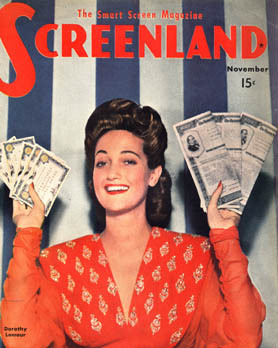 In Variety‘s year-end issue, in which it lists the year’s top stars (measured in box office returns), Dorothy Lamour appears in the first position on the list of featured players. The accompanying article asserts with confidence that Lamour “will hit the star grouping during 1938” (Variety, January 5 1938, 49). Lamour, thanks in large part to her sarong and the publicity machine at UA, had officially arrived as a presence in Hollywood. Despite the fact that Lamour herself almost certainly never spoke those words, we can see that studio publicity is already, even at this early stage in her career, putting Lamour in an adversarial relationship with her sarong. This article sheds some light on the aforementioned 1946 sarong-burning incident; the idea itself had been around, as we see, from her second South Seas picture. Moreover, this article suggests that the studio responsible for promoting Lamour, be it Paramount or United Artists, wants to have it both ways. They want Lamour to be instantly recognized for her alluring appearances in a sarong, but they also want a bit of controversy. Lamour is defined both in terms of the sarong and in terms of her alleged rejection of the sarong. This opposition would follow her for the rest of her career. In the late 1930s, even when sarongs were not part of her role, the press found a way to promote Lamour’s exoticism. The next important step in the formulation of Lamour’s star image came in 1940, when she was cast with Bob Hope and Bing Crosby in Road to Singapore (Victor Schertzinger, 1940). The image of Lamour is more than twice the size of the ad’s images of Hope and Crosby. A banner across the bottom of the ad shows three images of the film’s stars: Lamour wears a sarong in all three images, and Hope and Crosby wear what seem to be bedsheets cut to ‘resemble’ sarongs. They frolic with the sitar amidst text that reads, “Sarongs…Sarongs…and more Sarongs. Songs…Songs…and more Songs”. Finally, the last lines of a whimsical eight-line poem that is printed at the ad’s left edge read, “And you’ll lose those winter blues/As your heart thrills to Lamour” (WCFTR clipping file Lamour). In this one ad, we can see how Lamour’s identification with the sarong is invoked in at least three ways. 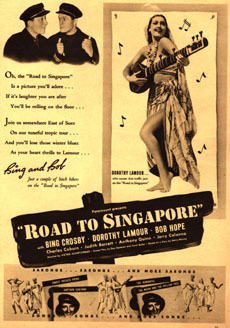 First, she is shown wearing her trademark garment in the largest single image in the ad; second, the text in the banner lets viewers know that, indeed, Dorothy would be seen in her famous attire in this film, even if it is a comedy; and, third, the fact that Hope and Crosby wear mock sarongs refers to the indelibility of Lamour’s image. The ad encapsulates the shift in Lamour’s star image around the debut of the ‘Road’ series. Paramount obviously did not wish to discard the well-established sarong image, but neither did it want to waste a chance to promote Lamour as a versatile performer who could handle comedy as well as romance and musical numbers. The Road to Singapore represented a perfect opportunity for promoting such versatility. The presence of Hope and Crosby would be sufficient to attract viewers interested in comedy; the presence of Lamour as a romantic interest was a bonus, and if she could also make them laugh, all the better. It made good business sense for Paramount to include ‘something for everyone.’ Hope neatly summarized the situation: “Dottie knew that in dialogue and laughs, she was doomed to come in a distant third. Of course, she was always dressed in a costume that made the eyes of the audience wind up on her, so she was patient with us” (Lamour, 96-97). It might seem that the first Road movie would have been an excellent opportunity for Paramount to cast an unknown as the romantic interest. With the combined box-office pull of Bing Crosby and Bob Hope (who in 1939 ranked second and tenth, respectively, on Variety‘s year-end list of Paramount’s top stars [Variety, January 3 1940, 29] (6)), one would think that box office success was almost inevitable: why not use the opportunity to introduce a new face to the public? So, why, then, was Lamour selected for the series? Unlike, for instance, Claudette Colbert and Barbara Stanwyck, two of Paramount’s biggest actresses, Lamour’s screen persona was still, in 1940, relatively indistinct. A sarong does not a character type make. Colbert and Stanwyck were by this time established as serious, versatile actresses, and both had won Oscars by 1937. To compare Lamour to these two renowned performers is somewhat unfair, but the point, I think, is valid. Lamour was, in 1939, a successful box-office draw but relatively critically unpraised as an actress. Colbert, Stanwyck, and other Paramount actresses were seen in a number of demanding dramas and comedies which relied on more than their ability to fill out a revealing piece of clothing in order to attract viewers. In a word, Lamour’s persona was still, despite her already indelible association with the sarong, malleable enough to make Paramount’s decision to cast her in Road to Singapore a logical one. The ‘Road’ series was successful in that it added an important dimension to Lamour’s image that would stay with her for the duration of her career. Though she was still associated with the sarong, she was now also noted for her comedic skills (especially in the ‘Road’ films subsequent to Singapore (7)) and, more specifically, for her ability to balance comedy with romance. This is not to say that the sarong image was jettisoned; it remained an important part of Lamour’s screen persona. A very funny photo spread from a Christmas issue of a fan magazine shows Lamour opening a number of prettily wrapped presents beneath a tinsel-heavy tree. 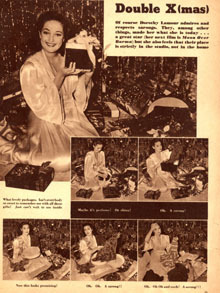 The bulk of the page consists of six photos of Lamour and her packages in various states of unwrap. Photo 1: Lamour smiles broadly and holds up a gift to the camera. Caption 1: What lovely packages. Isn’t everybody so sweet to remember me with all these gifts! Just can’t wait to see inside. Photo 2: Lamour gleefully unwrapping the first gift. Caption 2: Maybe it’s perfume! Or china! Photo 3: Lamour glumly removing a sarong from the box. Caption 3: Oh. A sarong! Photo 4: Lamour holds a round, flat box up for the camera. She looks hesitant. Caption 4: Now this looks promising! Photo 5: Lamour extracting another sarong from the box and holding it at arm’s length, as if it smelled bad. She wears a look of disgust. Caption 5: Oh. Oh. A sarong!! Photo 6: Lamour, exasperated, holds her hand to her forehead. She is surrounded by the debris of numerous packages, all of which contain sarongs. This photo series neatly plays off both Lamour’s trademark attire and her comedy skills. The ‘Road’ movies encapsulate the principal facets of Lamour’s image: her sarong, her comedy, her sexual appeal and her singing ability. There is, however, another very important aspect of Dorothy Lamour’s star image that her films themselves do not explicitly address. Lamour’s star image was, after a certain point, largely defined by her noteworthy contribution to the war effort. Lamour is said to have single-handedly sold over $300 million in US War Bonds, earning her the nickname “The Bond Bombshell”. For her efforts on this front, Lamour’s star image was appended in numerous ways: she was now seen in light of her patriotism, which in wartime was no small matter. Her tirelessness in selling bonds could only be praised by the press, as indeed it was; her cheesecake factor also skyrocketed as a direct consequence of her involvement with the war effort: soldiers made her their number-one pinup girl for several years running. Their nicknames for Lamour included “sweetheart of the fox hole”, “paratrooper pet”, “glider girl”, and “queen bee of the South Pacific Island”, among others (Parish, 343). Simply put, Lamour’s wartime efforts added a whole new range of connotations to her star image. Lamour writes that newspapers documented the entirety of this tour, and her wartime efforts became a key part of her star persona (Lamour, 114). A small item from Movies magazine in 1943 notes, “Time was when Dorothy Lamour was identified chiefly with a sarong – now it’s bonds, for Dottie has proved herself to be one of Uncle Sam’s most successful bond salesgals” (WCFTR clipping file Lamour). There is plenty more to say about Dorothy Lamour. Especially interesting is the anecdotal evidence that, after the mid-1940s, few of her films – save the ‘Road’ movies and the ones in which she appeared in a sarong – were successful. Though per-film box-office receipts for this era are simply not available, it would be interesting to find out if Lamour was indeed a case of typecasting that was too successful. That is to say, Paramount, in forever associating her with either a sarong or the Hope/Crosby duo (or both), carved out so specific a niche for Dorothy Lamour that very few of the films in which she was off-cast were successful at all. A few questions remain. First, why was Dorothy Lamour’s image so regular for so long, and to what degree was she unique and/or ordinary in this regard? To offer a few tentative answers, we should consider Lamour as a commodity, and as a cog in the machine of Paramount’s star system. Like other Hollywood performers, Lamour was, to her studio, an investment. Paramount put a certain amount of money into crafting and promoting her image in the hopes that that image would find favor with audiences, thus increasing the return on their initial outlay. When a successful formula was discovered, it was in the interests of the studio to exploit it. Thus, the proliferation of sarong pictures and, later, lighthearted comedies in which Lamour provided both romantic and comedic attraction. The simple answer to questions about the consistency of Lamour’s star persona is that her image was a proven moneymaker for the studio. It may well be that Paramount did its job too well, creating a set of associations that were so indelible as to prohibit Lamour from attaining box-office success in any film that did not fit into a set of rigorously prescriptive mechanisms. No one else could lay claim to being the Sarong Queen of Hollywood. Lamour, truth be told, was never a great actress. She often looked somewhat uncomfortable on the screen, overshadowed by her more famous and/or talented costars. Her screen image was principally built around her physical attributes. She looked great in a sarong, a fact which no one disputed. Her extremely long, dark hair, and unusually large lips and eyes lent her an ‘exotic’ look that Paramount exploited to the fullest. Lamour’s image was crafted not so much around her skills as around her appearance, surely not an uncommon occurrence for actresses in the studio era. Though I have argued that Lamour’s image was enhanced a great deal by the addition of the romantic comedy angle provided by the ‘Road’ films, it is important to note that in every one of the seven ‘Road’ pictures, Lamour donned a sarong. She was effectively not off-cast; instead of steering her established image in an entirely new direction, Paramount merely supplemented it in the ‘Road’ movies. Attempts at offcasting Lamour – from 1938’s High, Wide and Handsome to 1949’s Manhandled (Lewis R. Foster) – generally resulted, if we believe the anecdotal evidence, in disappointing box-office returns. First impressions clearly proved very important when gauging the public response to Lamour’s image. So successful were her sarong pictures that, even as late as 1964’s Pajama Party (Don Weis), the press-book refers to her as the ‘Sarong Girl’ (Pajama Party press-book). Like any actress, Dorothy Lamour presented the studio with a difficult problem: how to exploit the particular characteristics and/or talents of a particular performer? But, though the solution to this problem will differ for every performer, the process of finding the solution is business as usual. Lamour happened to look good in a sarong, and the public happened to have a corresponding appetite for South Seas pictures. Had the vogue in 1936 been for underwater synchronized swimming films – as it was about a decade later for another niche performer, Esther Williams – it is possible that Dorothy Lamour would be remembered today not for her sarongs but for her aquatic grace. One drawback to the clipping file is that many items lack key facts such as publication name, date, and page number, as they have been cropped from their original sources. However, many of the pieces can, by examining content and context, be dated with some certainty. For instance, an undated article on Lamour’s favorite Christmas desserts appeared in either 1937 or 1938, as the text refers to the “Big Broadcast” – a reference to The Big Broadcast of 1938. But some items are impossible to date – such as a Hollywood magazine cover that shows Lamour in a sarong. This is the “chronological dimension” to which Dyer refers; when it is lacking, its importance emerges. He goes on to say, not inaccurately but still a bit caustically, “That her acting was as primitive as her screen character’s ancestry, seemed to bother only a few”. On the back of one of the promotional glossies, there is scrawled, “Before Dorothy’s sarong era” – which is, of course, not true. I only wish I could identify who wrote this, and when. As far as I can tell, this booklet was not a press-book per se but a program distributed to patrons in the lobbies of theaters showing the film. Probably this is only one of several trailers for the film, but it is the only one readily available. This informal ranking is based on box-office receipts. Lamour herself admits that it took her a while to take part in the barrage of on-set ad-libs (Lamour, 88).